Jubilee Voices in the Community! 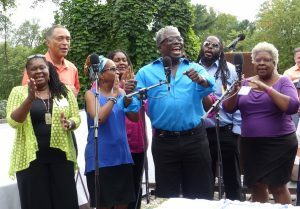 Washington Revels Jubilee Voices brings its high energy program of traditional African American music to New Creation Church as the congregation celebrates its 25th-anniversary year. The Voices will perform songs from across the spectrum of the African American experience, ranging from 19th-century spirituals, field hollers and shouts to anthems of the Civil Rights movement. The service begins at 10 am and is open to the public; Jubilee Voices will perform from 11-11:30. There will be several opportunities to sing along — come help the Voices celebrate with members of our community! TICKETS: Free and Open to the Public!